Driver and passengers for a willys jeep in 20mm scale. 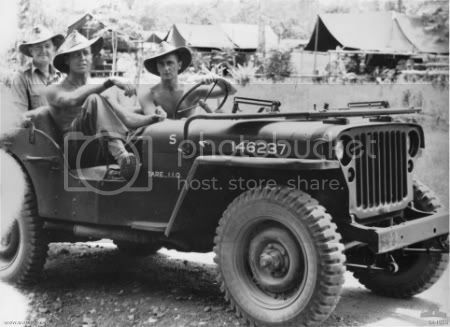 Figures in jungle uniform with slouch hat. 1 Driver, 1 front seat passenger and maybe 2 rear passengers (if enough orders are taken, maybe a variety of passenger types from digger to officer). As i would be using a few jeeps in my games (one for each mountain gun or short 25 lb gun, HQ elements etc), I would be looking at least at 6 to 8 orders for myself. I would like two jeep crews at least. Perhaps it would be a good idea, to join this topic with the casualty topic to create a generic Pacific war groupbuild project for figures who are not fighting/are in rear area's. I would like some Jap prisoners sitting down demoralised, some Aussies standing around idly, some Aussies hauling equipment. Think of the various AB Figures sets for diorama's. Real wrote: Perhaps it would be a good idea, to join this topic with the casualty topic to create a generic Pacific war groupbuild project for figures who are not fighting/are in rear area's. I would like some Jap prisoners sitting down demoralised, some Aussies standing around idly, some Aussies hauling equipment. Think of the various AB Figures sets for diorama's. If we keep each request to its own post, it is easier to keep track of, and makes it easier for others wanting figures to know exactly what is being proposed. For example, but putting Character/personality types in with the Aussie militia wouldn't get me voting at a glance, as i am not wanting militia figures, but if under their own post it lets every one know the idea has been put forward. Thus, this post is for jeep crews. Japanese prisoners would be another post, as would Aussies hauling equipment.